Basically, it seems as if the centre flap, despite only being 20 cm wide, affects the entire span of the beam wing, even if only by a small amount. The low pressure region behind/below the flap pulls in, and therefore accelerates, the air under the entire beam wing, thus increasing downforce by itself, and also allowing the beam wing to have more camber while keeping the flow attached underneath. Of course, like many details on an F1 car, it’s not *the* optimum approach, but the best approach they can take given the restrictive rules in place. A typical twin-element wing would be more efficient, but that’s not allowed; instead, they have to take advantage of the curious 20 cm free zone in the middle of the wing, since outside that zone there are no slots or flaps allowed. 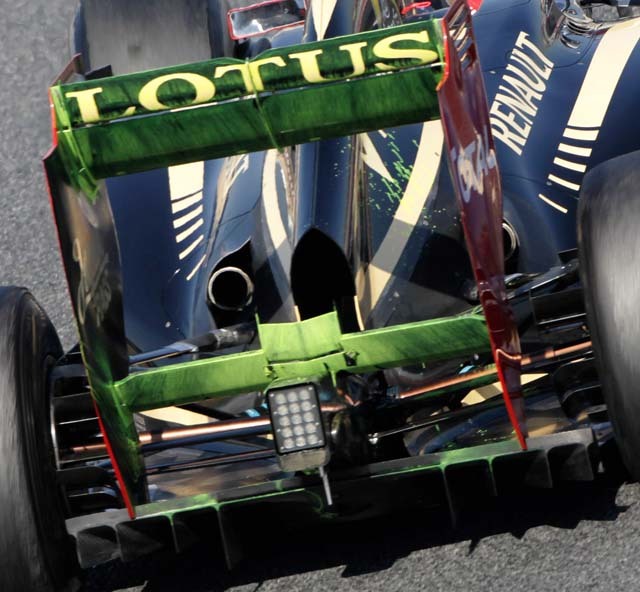 Just like the double-diffuser, high-noses, barge-boards and pre-2009 curvy wings, the little flap isn’t the best idea where there are no limits in that region, but it’s a brilliant work-around to a typically restrictive F1 rule.